Why am I getting all zeroes in my results? FAQ Why am I getting all zeroes in my results? If you are getting all zeroes in your results your file is crashing or you have everything set as existing. Your file could be crashing for a number of reasons. A very common reason is that the interior surfaces are not inputted correctly. Interior surfaces should be entered in conditioned spaces, and need to be set adjacent to an unconditioned space. If you have a wall with negative area, your file will crash. A negative area happens when you have a glazing area that is larger than the wall it is in. For example, if you have a 60 square foot wall and a total of 70 square foot of glazing in the wall, the file will crash. The same goes for roofs and skylights. 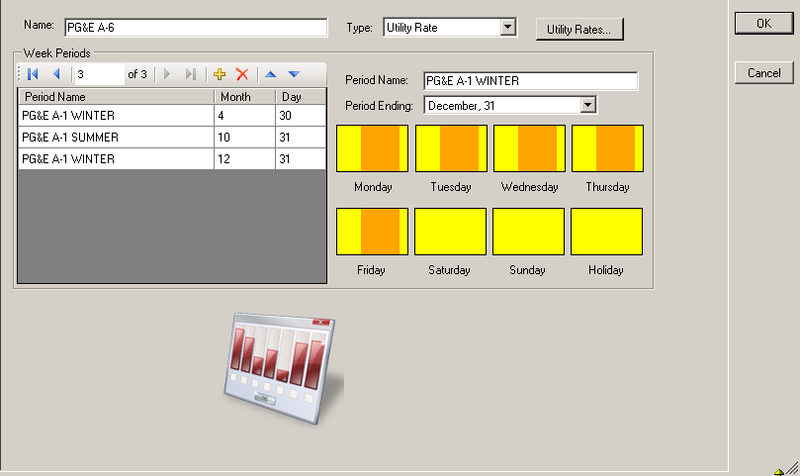 If you have entered Week Periods in the utility rate incorrectly, your file will crash. Week Periods need to be is chronological order, starting on Jan. 1st and ending Dec. 31st. The month and day is the ending day for that period. So the top line starts on Jan. 1st and ends on the date entered. The next line down starts on the day after the previous period ends. The last period needs to end on Dec. 31st. See the screenshot below. If you have selected many DOE-2 Reports to be run your file might crash. Deselect all of the DOE-2 reports then select only the reports you need. ← Why am I getting all zeroes in my results?